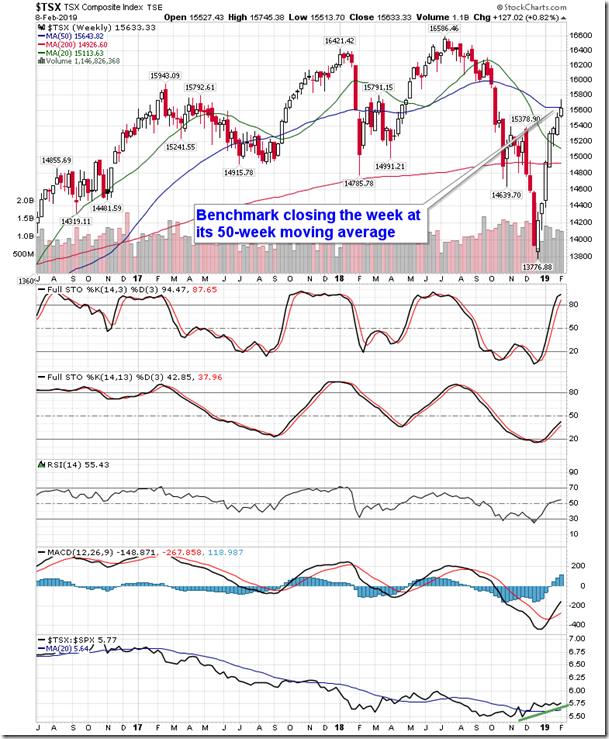 Major equity benchmarks close just below their 50-week moving averages as signs of indecision become apparent. 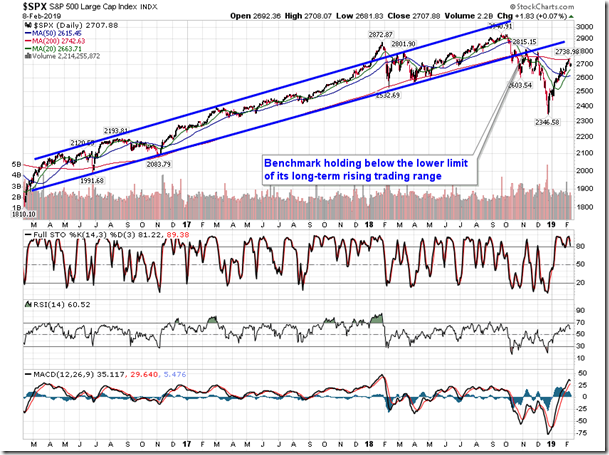 Friday saw a muted session for stocks as investors continue to speculate on the outcome of trade negotiations between the US and China. The S&P 500 Index closed higher by just less than a tenth of one percent, led by a mix of defensive (staples and utilities) and growth (technology and communication services) sectors. 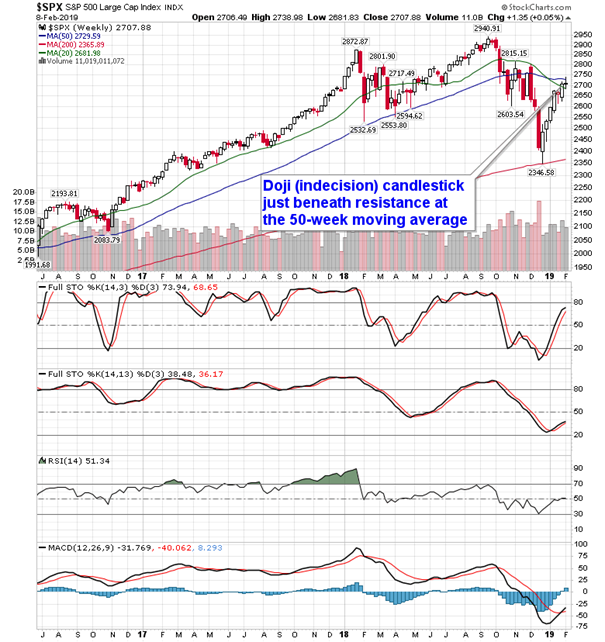 For the week, the 0.05% gain on the large-cap benchmark charts a doji candlestick directly beneath a significant point of resistance at the 50-week moving average. 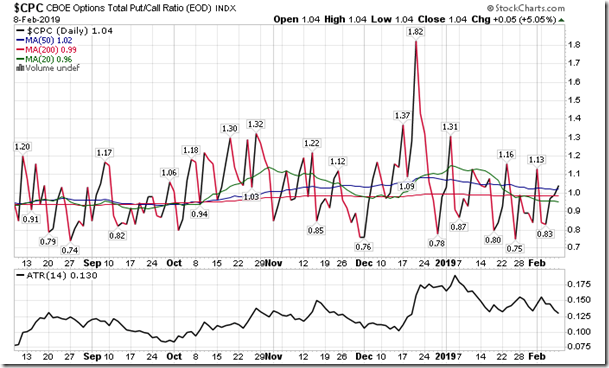 This indication of indecision suggests investor reluctance to push stocks higher with a major technical hurdle overhead and overhanging headline risks pertaining to global growth, trade, the government shutdown, and the subsequent debt ceiling deadline. 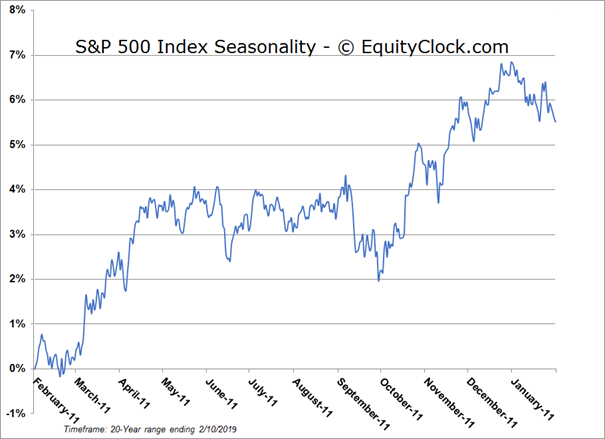 Seasonally, the back half of February tends to see weak results for US equity benchmarks now that the bulk of earnings season has now past. 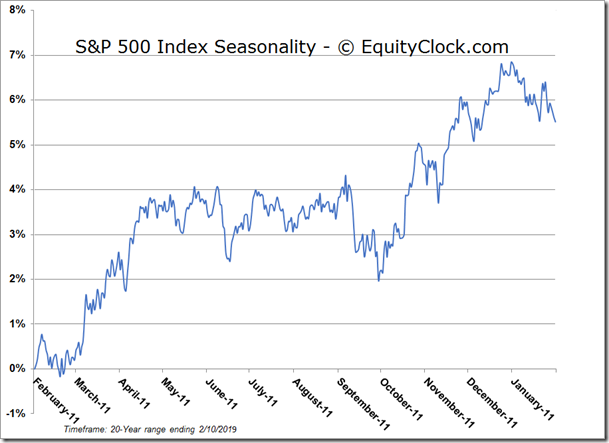 Through the first 16 calendar days of February, the S&P 500 Index has gained an average of 0.53% with 60% of periods showing positive results, while the rest of the month has averaged a loss of 0.35% with only 46% of periods ending higher. 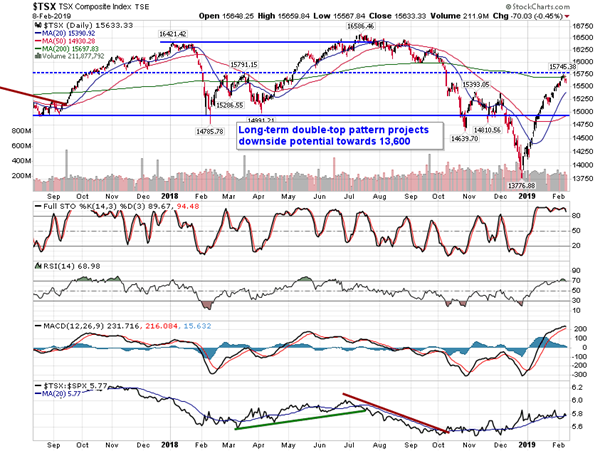 Turning north of the border, the Canadian benchmark is testing a similar juncture. 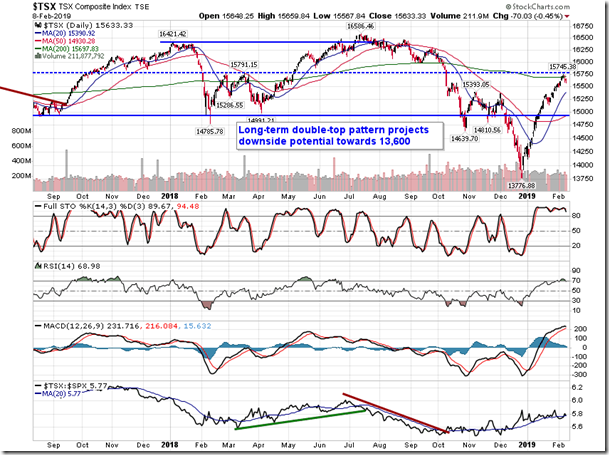 The TSX Composite ended at its 50-week moving average as of the close on Friday, hinting of similar indecision amongst investors following the substantial seven week rally from the December low. 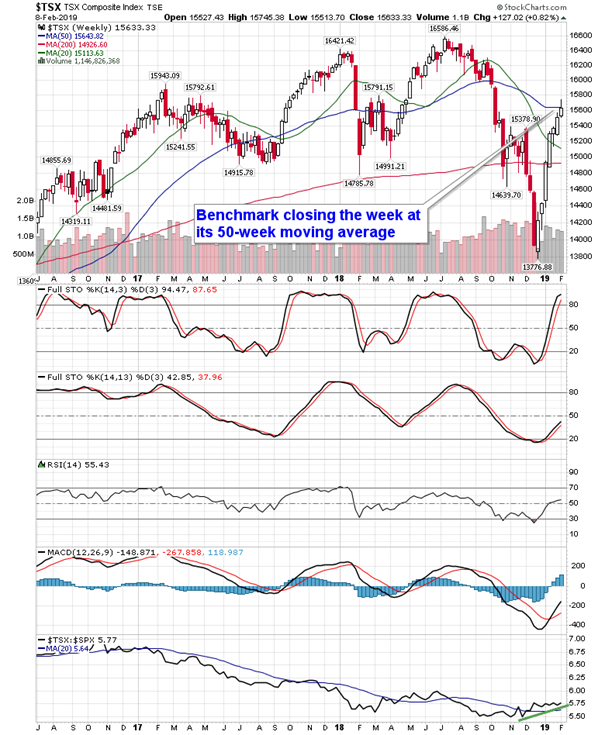 Momentum indicators on this weekly look continue to trend lower, an indication of a lack of buying demand. 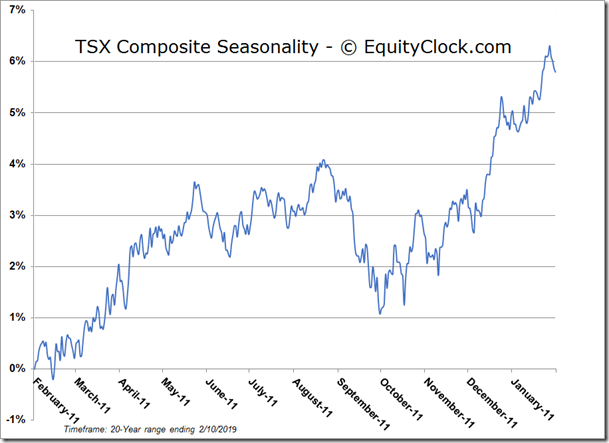 The Canadian index has outperformed US counterparts since the start of December, following its average seasonal pattern that sees positive relative performance into the end of February. 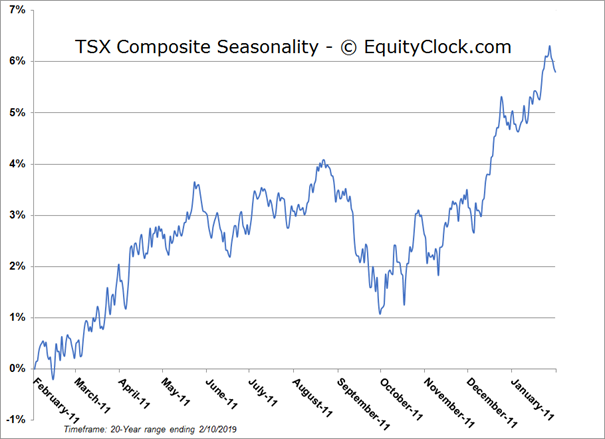 Perhaps no coincidence, this timeframe is inline with the run-up to the RRSP contribution deadline at the end of the second month of the year. 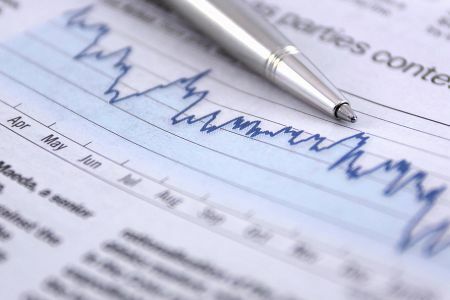 This flow of funds tends to wane following this date, leading to the outperformance of American benchmarks leading into the IRA contribution deadline in the middle of April. On the economic front, an abnormally strong Labour Force Survey out of Canada had investors scratching their heads. 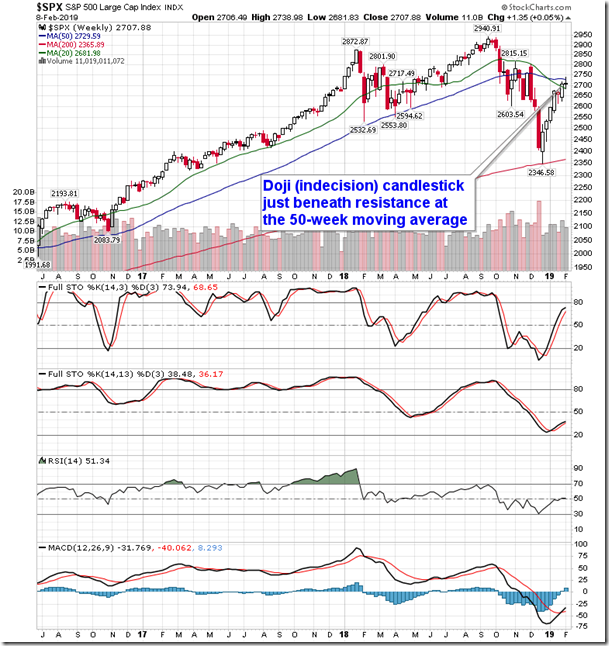 The headline print indicated that employment surged by 66,800 in January, far surpassing the consensus analyst estimate that called for a gain of only 5,000. Despite the significant increase, the unemployment rate ticked higher by two-tenths of a percent to 5.8%, the result of an increase in the participation rate. Stripping out the seasonal adjustments, employment actually declined by 198,500, or 1.1%, which is much better than the 1.6% decline that is average for the first month of the year. Full-time employment declined by 226,300, or 1.5%, and part-time employment was higher by 27,900, or 0.8%. The average change for each at this time of year is -1.8% and -0.4%, respectively. 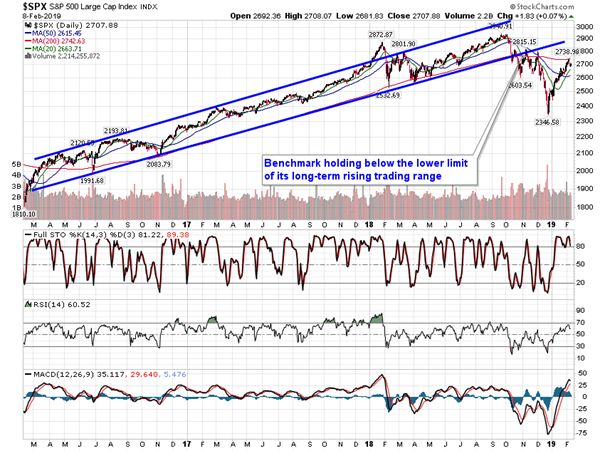 To receive the full analysis that we distributed on Friday, subscribe to Equity Clock at https://charts.equityclock.com/subscribe. 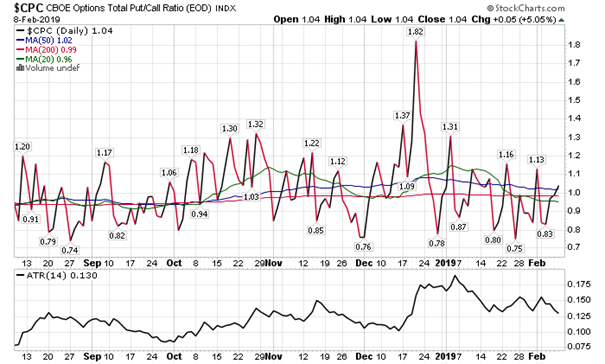 Sentiment on Friday, as gauged by the put-call ratio, ended bearish at 1.04.